Acoustic players — Now there’s finally an affordable, mobile Acoustic playing and recording system with professional sound made just for you! Inspired by a must see documentary on flamenco guitar master Paco de Lucia, iRig Acoustic is the first acoustic guitar mobile microphone/interface for acoustic players. With iRig Acoustic and the AmpliTube Acoustic app, players now have a complete professional sounding mobile system for playing live and recording designed specifically for acoustic guitars on the go. There’s no argument that the best acoustic guitar sound reproduction comes from placing a high-end condenser studio microphone in just the right position in front of the guitar. iRig Acoustic, when used with AmpliTube Acoustic, is designed to perfectly replicate that ideal mic placement and accurately capture the full frequency range, tonal character and complex harmonics and overtones of acoustic guitars. It's able to do this thanks to the combination of its uniquely designed microphone enclosure, which combines the latest MEMS (MicroElectrical-Mechanical System) microphone technology with an omnidirectional polar pattern, placement of the microphone just inside the sound hole where the output is optimal and the sound is very detailed and focused, and the “calibration” process that optimizes the guitar sound like it is being miked externally with a high quality studio microphone. These technologies combine to capture the "complete picture" of an acoustic guitar — every vibration and sonic interaction — unlike piezo-electric pickups or magnetics that just capture the vibrations of the body top or strings. 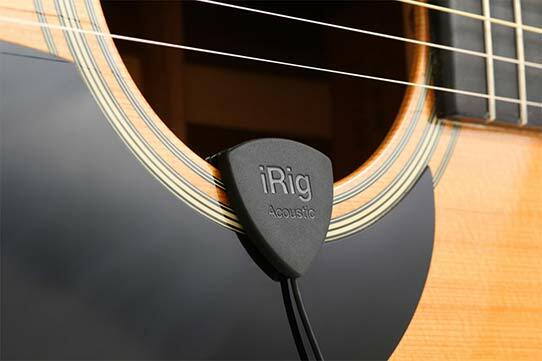 Simply put, iRig Acoustic delivers a pure and full representation of an acoustic guitar's tonal characteristics. They deliver a very precise compensation and accurate flat frequency response while being very resistant to mechanical vibrations that produce unwanted sounds, thus providing a very clear, open tone. In addition, MEMS mics are very durable and stable so iRig Acoustic will deliver consistent, detailed and focused sound performance after performance. iRig Acoustic offers you the convenience of being easy to install (or remove) on any guitar — no modification of any instrument is required to use iRig Acoustic. 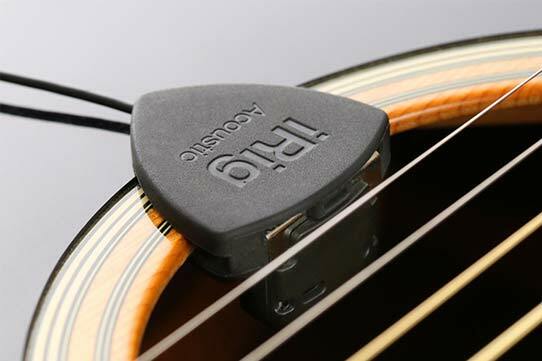 It simply securely clips on to the rim of the soundhole of an acoustic instrument and you’re ready to play. Because you can easily install and remove it, you can use iRig Acoustic on all of your acoustics, even during the same set! iRig Acoustic plugs into your device headphone/input jack with a standard 1/8” TRRS cable that also allows you to monitor your performance thanks to the female stereo output jack placed on the in-line cable. Plug your headphones into this jack for private practice and monitoring, or you can line out to a mixer or powered speaker for full stereo acoustic performance. Steel String, Classical, Ukes, Oh My! iRig Acoustic comes with AmpliTube Acoustic FREE (download on the App Store), the new acoustic-specific AmpliTube app designed for processing and recording acoustic guitar and ukuleles. First, when used with iRig Acoustic, the AmpliTube Acoustic app features a calibration and setup process that measures and optimizes the frequency response of your acoustic instrument and provides the “sweet spot” sonic clarity, tonal characteristics and projection that you normally get in the studio with an expensive high-end studio condenser microphone positioned in just the right spot. iRig Acoustic and AmpliTube Acoustic deliver that ultimate level of acoustic realness and character as an optimized system for a fraction of the cost. As an acoustic tone studio, AmpliTube Acoustic features top-of-the-line emulations of popular acoustic amplifiers — 2 solid state amps and one tube amp, all with their own built-in effects sections — and stompbox effects, including a live performance “Feed Kill” feedback eliminator (hey, it happens), an acoustic compressor, graphic EQ and Parametric EQ; a 12-String emulator, a “Bass Maker” octave pedal, plus a “Body Modeler” that converts the sound of your guitar into another style of guitar. Need a parlor guitar sound for a specific song? No problem — just use the body modeler! 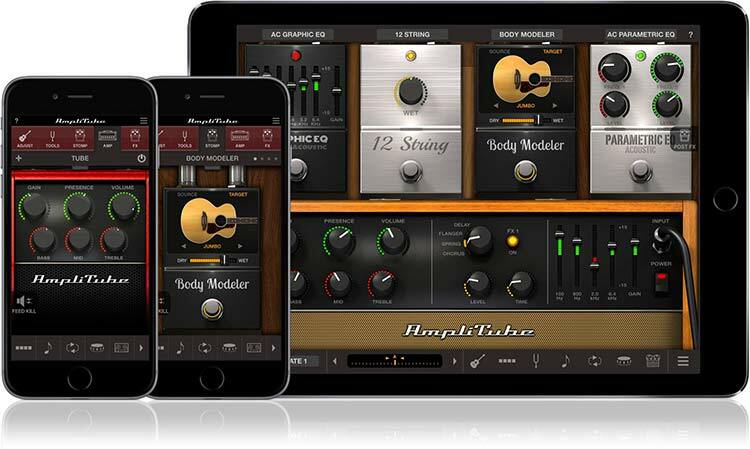 AmpliTube Acoustic also features all the goodies that make AmpliTube the world’s most popular mobile guitar and bass tone studios — a 4-track looper, 8-track recorder/DAW, speed trainer and UltraTuner, the world’s most accurate digital tuner. AmpliTube Acoustic is your new complete mobile Acoustic tone studio! 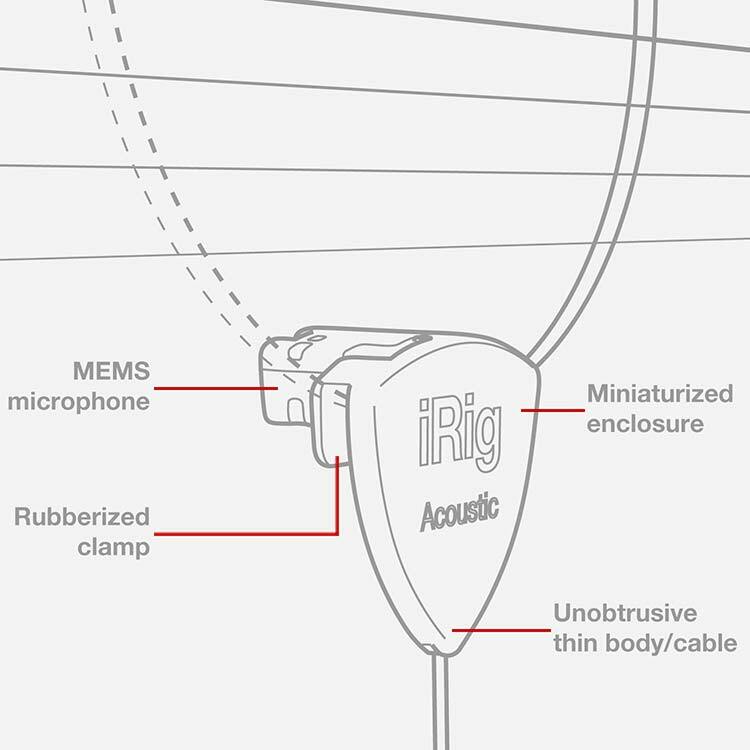 iRig Acoustic is the first affordable, innovative, patent-pending microphone pickup that installs in seconds — it quickly mounts securely in the soundhole of your flattop acoustic. Plug the 1/8” TRRS jack into the headphone jack of your compatible iPhone, iPad, iPhone touch, and it delivers the full range true natural sound of your Acoustic guitar right to your device and right to your audience. iRig Acoustic works with GarageBand for iPhone/iPad by itself, but for the best sound quality use it with AmpliTube Acoustic (free or full version) and route the audio to a GarageBand track using the Inter-App audio routing feature.